Planning a 40th birthday party is a risky endeavour indeed. There is a world of difference between planning a birthday party for an 18-year-old, a 21-year-old, or even a 25-year-old – compared with a 40th birthday party. At 18, 21, or even 25, most people approach their birthdays with a sense of fun and celebration, yet by the time the birthday boy or girl is approaching 30, people start to have mixed feelings about growing older. And by the time they’re turning 40? The feelings are usually not so mixed anymore. This can vary, of course, and anecdotally it does seem that men are perhaps more likely to approach their 40th birthday with a sense of pride and achievement than women – though this is just another (perhaps unhelpful) generalisation. The point is that when you are looking for 40th birthday party ideas, the most crucial first step is to understand how the birthday person is feeling about their upcoming milestone birthday, and to make your plans accordingly. Whether they are looking forward to a huge night of fun and celebration, or more geared towards an intimate affair with their closest friends and family, we’ve got a wide range of 40th birthday party ideas for you to consider. The Hollywood Glam birthday party theme is the perfect idea for a new 40-year-old who loves a bit of style and sophistication. 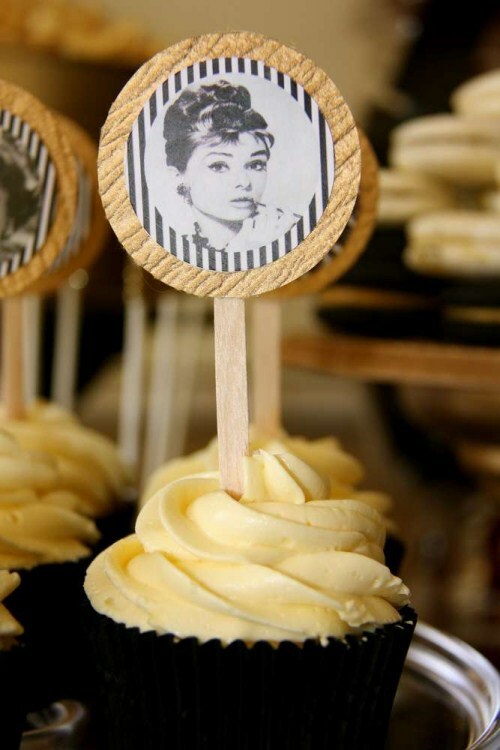 Old-style starlets like Audrey Hepburn oozed class and charisma, so a Hollywood Glam birthday party would be a 100% class act. From the choice of decorations to the food (and most importantly, desert bar) on offer, and from the invitations to the dress code, a Hollywood Glam theme is a perfect recipe for an enjoyable evening. The theme also lends itself to a wide variety of Hollywood-themed party games. 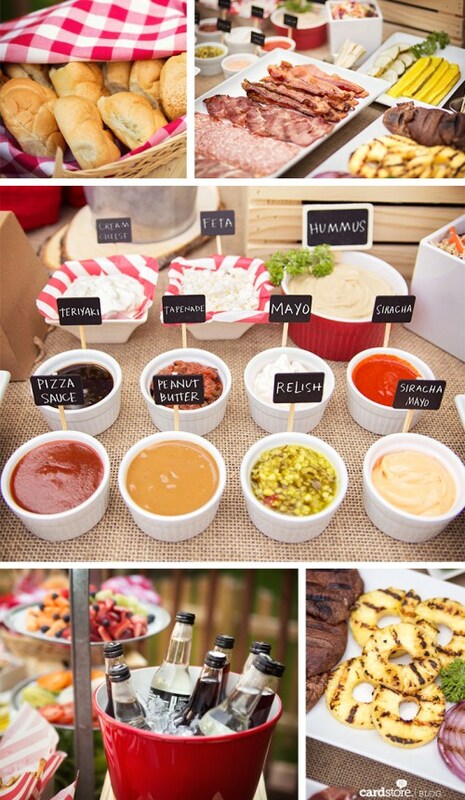 We love the idea of this gourmet burger bar, especially since it lends itself to a range of 40th birthday party styles. A gourmet burger bar would work equally well at an indoor or outdoor function, as well as for a male or female celebrant. Most people enjoy a good burger, but by the time you’re reaching your 40s your tastes tend to become a little more refined, and a gourmet burger bar allows guests to create their own perfect combinations. If you’ve got vegetarians or vegans on your guest list, remember to include some veggie patties or grilled mushrooms instead of beef, and you may like to offer gluten-free buns as well so that everyone can participate. Turn your gourmet burger bar into a party game by having people write down their top-secret burger combinations and compiling the recipes plus photos of each crazy creation into your own recipe book. You could even have the book printed and sent out to your guests as a belated party favour. This is just a silly idea but it’s one that made us giggle when we came across it, so we thought it was definitely worth including. You may need to be a little creative depending on the chocolates that are available in your area, for we can think of fantastic gags be made with other chocolate names too: Curly Whirly, Wagon Wheel, Bounty… how many can you think of? A lot of people have turned into pseudo-superheroes by the time they’re 40: juggling a now well-established professional career along with commitments to their original family (elderly grandparents and even parents now needing some assistance), as well as their ever-increasing commitments to their new family: spouse, children, and pets. They’re likely also juggling friends, volunteer work, as well as commitments at their children’s schools, and not to mentioned playing taxi driver for a host of after-school and weekend activities. 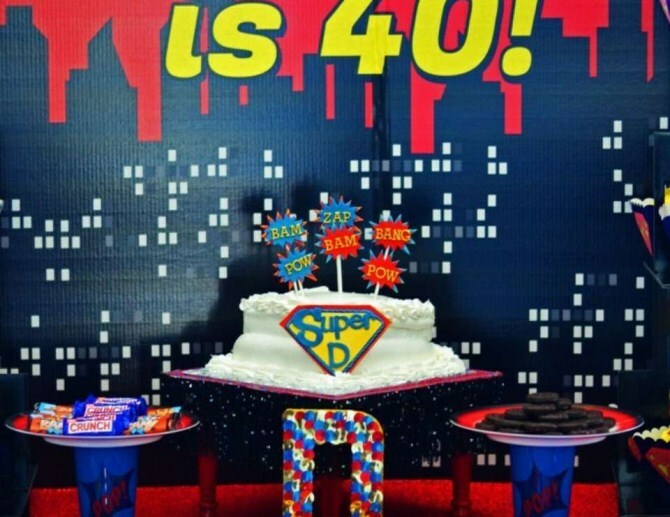 Add that altogether and you’ve got way more commitments than there are hours in the day, so why not a superhero themed party for the 40-year-old who deserves a little praise and recognition for everything they do? Every birthday party needs some professional element: professional catering, a band or DJ, or a showstopping cake: something to show just how much time and effort went into the planning and preparation of the event, and something to elicit the oohs and ahhs necessary at every special occasion. For a 40th birthday party, you’ve got a whole life to celebrate, so consider having a professional themed photo montage created of the person being celebrated. The best way to pull this off is to have the final product be a surprise to the birthday person, so contact everyone on the guest list privately before the event and asked them to email or post you copies of any special photos that they have: especially photos that the birthday celebrant may have forgotten about or may not even know that they exist. 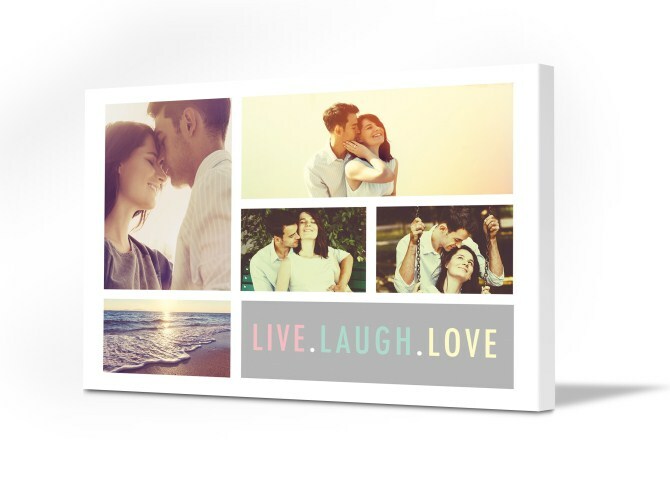 The final product can be a group present that is guaranteed to be cherished. 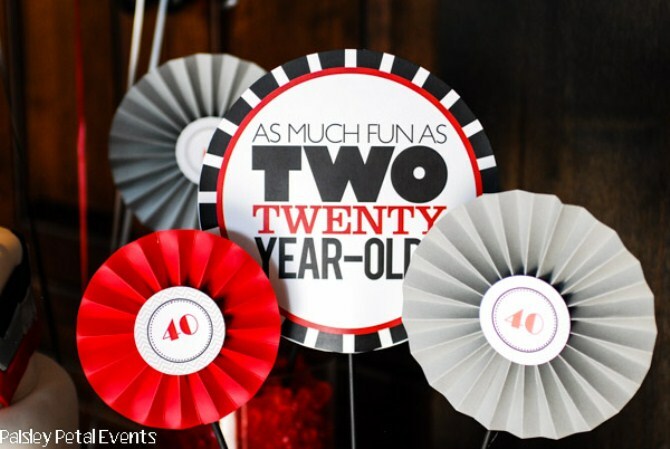 A fantastically fun idea for a 40th birthday party is a “party like you’re 20” theme. 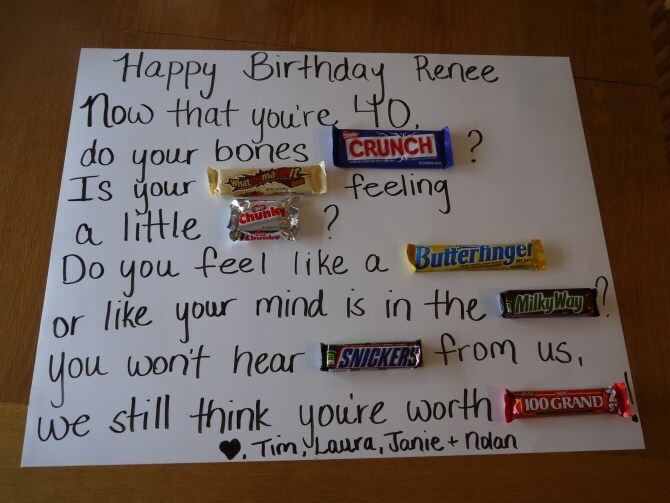 After all, a 40-year-old is just a 20-year-old with twice as much experience, so why not take a trip back in time and throw a 40th birthday party in just the same way that you would throw a 20th birthday party? In case you’ve forgotten: the music would be loud, the lights flashing, and alcohol would most likely be flowing in abundance. But none of that expensive wine or top-shelf spirits: no no. Out must come the beer kegs and cask wine. Even if you don’t plan use to include alcohol as part of the birthday plans, you can still play “old-fashioned” drinking games with non-alcoholic beverages. 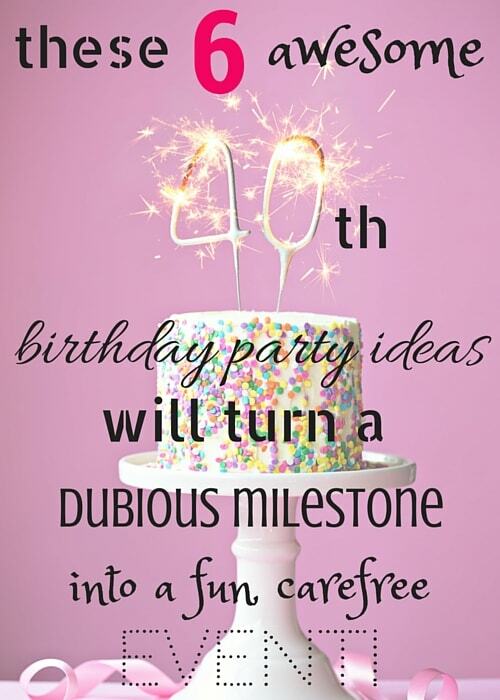 This is the perfect 40th birthday party theme for anyone looking to relive the carefree days of their 20s! Whatever birthday party ideas you choose for a 40th birthday, the most important factor is that the birthday person gets to spend their special day with the people most dear to them. Run your ideas by them first, so that you know for sure whether, for example, they would like their children or their friends’ children included in the celebrations, or whether they would prefer it to be adults only. And don’t forget the cameras! A 40th birthday party is a special occasion, one that might even warrant hiring a professional photographer, even if just for an hour. And once you’ve got that perfect photo of the birthday celebrant looking carefree and happy, turn it into a professional quality canvas print to be treasured forever.